Skip introduction, let me run the tool! What is backtest overfitting? And why should I care? By checking this box, you acknowledge that this web site is a demonstration of a mathematical concept known as "backtest overfitting." The software and material on this site should NOT be interpreted as a recommendation to buy or sell any security or securities; as applicable to the specific investment needs of any particular individual or organization; or as applicable to the forecast of future market prices or trends. This "quick-start" option uses random (system generated) values for all of the inputs available in Option 3. You can enter values in one or more of the text boxes below. A more detailed explanation of what each box does is provided in the tutorial document below. Maximum Holding Period an integer; ranges from 5 to 20. 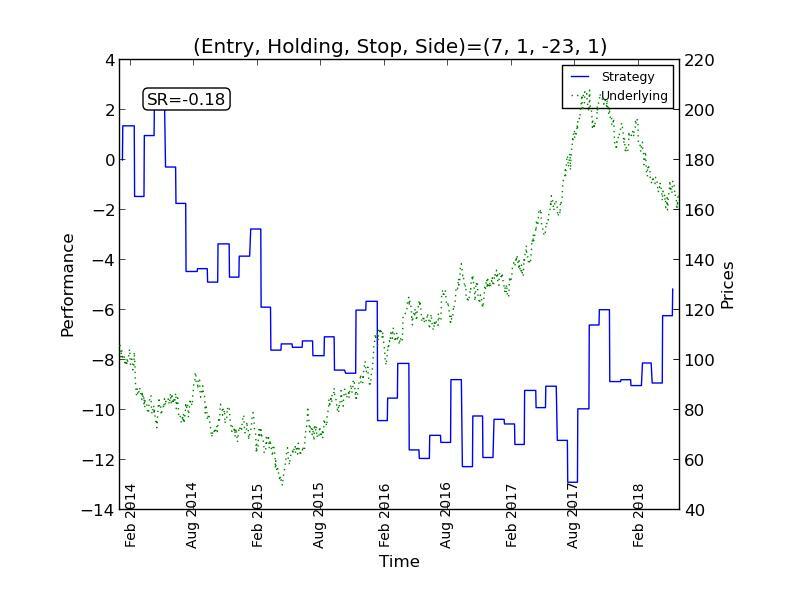 The number of days a stock is held before it is sold if no other exits (e.g., the stop loss) have been triggered. 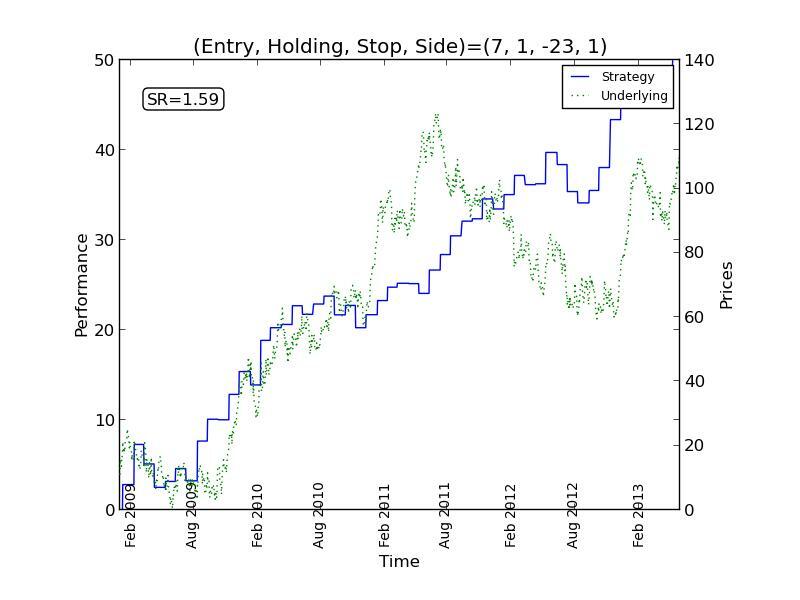 Maximum Stop Loss an integer %; ranges from 10 to 40. The percentage loss from the initial entry at which point the stock will be sold. Do not enter the '%' sign. Sample Length an integer; ranges from 1000 to 2000. The number of days simulated. The sample data considered as the daily closing prices. You can enter values in one or more of the text boxes below. Sample Length an integer; ranges from 1000 to 12000. The number of days simulated. We suggest between 5000-6000 as it makes almost equal length data on IS and OOS sides. The sample data considered as the daily closing prices. Default values: If you do not enter a value or enter a value that is outside the range mentioned above, a default value will be used. The default values are: maximum holding period = 7; stop loss = 10; sample length = 1000; and standard deviation = 1. About execution time: The values for maximum holding period, stop loss and sample length significantly affect the number of iterations performed by the program; the larger these values are, the longer the program will run. A more detailed explanation of options is provided in the tutorial. SSRN 2597421 by Amir Salehipour et al. Please send any comments or questions for this site to: John Wu. David H. Bailey, Jonathan M. Borwein, Marcos Lopez de Prado, and Qiji Jim Zhu Pseudo-Mathematics and Financial Charlatanism: The Effects of Backtest Overfitting on Out-of-Sample Performance, Notices of American Mathematical Society , May 2014, pg. 458-471. We gratefully acknowledge the helpful comments and suggestions from colleagues and friends in shaping this web site. In particular, the suggestions from Mr. David Witkin of StatisTrade, Bin Dong of LBNL, and Beytullah Yildiz of Turkey were extensive and very helpful in improving readability of the web pages. Thanks!